From a Nation renowned for great literary accomplishments comes yet another remarkable addition by Bosun Abdul. 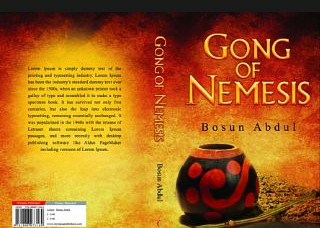 Gong of Nemesis is an epic fiction directed at dissecting societal vices like greed, corruption, etcetera, using characters easily recognisable from our very own day to day experiences. It is a witty play set against the backdrop of rural Nigeria which juxtaposes ancient traditions and values alongside relatively post-modernist norms. The plot is aimed at entertaining the reader whilst passing its strong moral message.